The opening shots of the music video for Tayyib Ali’s “Keystone State of Mind” show glimpses of City Hall, 30th Street Station, Fairmount, Walnut Street shops and other well-known Philly destinations. And even though he relocated to Los Angeles, it’s fairly evident in his career so far that he’s a Philly native. “It’s beautiful – it’s what I saw every day [growing up] – it’s a piece of the world you get to show everybody,” Ali said. The video was released in March 2011 as the title track for his first mixtape of the same name. Most recently, he released an acoustic hip-hop track, “Ride With Us,” on which he collaborated with Cisco Adler. It wasn’t their first time working together, and the two worked on Ali’s single off the Keystone mixtape, “California Love,” last year. But on both tracks, Ali’s laid back relaxed hip-hop beats seem at home lumped with Adler’s easygoing acoustic accompaniment. Originally from Mt. Airy, Pa., Ali said he moved to North Philly when he was 13-years-old. But beyond his popularity in Philly, he has enjoyed a solid reception across the country. “Fans supporting your music from wherever they live has been an amazing feeling,” Ali said. Before he was dropping beats on the West Coast or making himself known in the Northeast, Ali said he’d been rapping since he was 14-years-old, and it “got more serious” when he was 16 or 17. But he has made up for his young age with experience in a short period of time. His career’s backstory is still relatively short – after releasing several well-received singles including “Kid Again,” “Cold World,” and “PA Chillin,” he began to develop an East Coast following. Ali released his first EP, “Eighteen,” when he was 18, and more recently, in April of last year, his “Keystone State of Mind” mixtape was released online. 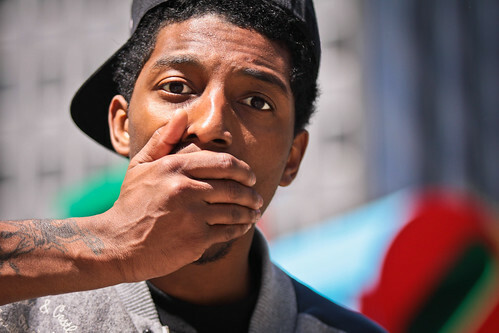 Ali’s done shows with Super Smash Bros. and Sam Adams, and played the 618 Festival at Festival Pier with Shwayze – a stage he claimed as his favorite Philly venue – and the Kamikazz Festival in Connecticut. In his cross-country travels, Ali said he found his favorite venue to be the Fox Theater in Boulder, Co.
“It was a dope place for my music to be,” Ali said. And though he’s young – a comment Ali said he’s heard plenty of times before – he’s been made strides in forming a more serious career. Currently, Ali has been working on continuing to spread his music, and on an unnamed upcoming mixtape. He’s developed a solid student fan base and continues to perform at colleges across the country. He played a show at Colgate University in New York last week, and he made an appearance on March 31 at Temple’s Broad Street Lounge. A student appreciates her musical upbringing and how it has influenced her.